In the seventeenth century Thomas Hobbes created an opus that counts among the most important in political philosophy. At the center of it is the “Leviathan”, a name that was formerly used to describe an evil aquatic creature in biblical mythology, essentially representing Babylon (which was supposedly very evil). 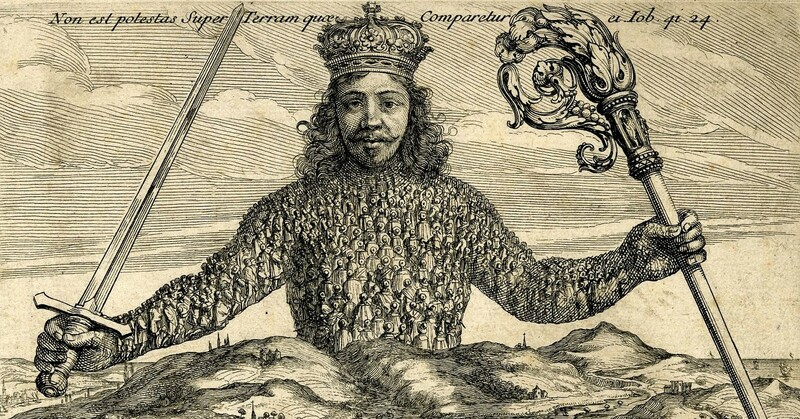 In Hobbes case, the Leviathan refers to the absolutist sovereign, made up (as one can see on the book’s cover) of all the people that define his state. This absolutist sovereign empowers control, which is — by being labeled Leviathan — seen as something bad. The Leviathan it despised and never wanted to be. First of all, let’s recap what Blockchain is actually good for. There is an excellent medium.com article on Blockchain by Adam Ludwin. To reach for even higher levels of praise, I daresay it’s by far the best I’ve read so far. So, if these are the bad things that come along with Blockchain & Co., what is the “big leap forward” that Blockchain stands for? The one thing which should more than compensate for all these disadvantages (which is pretty hard, because all these disadvantages are quite severe)? The one big thing that has righteously caused all the hype and myth for Blockchain? Well, it’s in fact decentralization. The fact that centralized control (the “middle man”, e.g., bank, government, or — as we put it — the man-made Leviathan) is removed from the equation. True democratization. No one man or (legal) entity dominates the system, or sets the rules (which, btw, also causes a lot of mess in any case where the original “rules”, codified into the very source code of the Blockchain-based system, e.g., Bitcoin, need to be adapted). No one man or entity can forge the system. Why is forging or cheating impossible? Because if you want to forge the system and exert control, you basically run against all other users in the system, one node against millions. So, more technically speaking, it’s virtually impossible for one node/user in the system to mine a block and, at the same time, mine the next block, too. Now, for a change, let’s look at human evolution: In the beginning there was a man. Just him. But that man found out very quickly that he can better enforce his interests (e.g., surviving, hunting, etc.) when he teams up with others. Small hunting groups came up. Later on, these turned into tribes, and eventually, thousands of years later, into states. These systems feature centralized control via dedicated organs, so-called governments (which are today in most cases democratically voted by all the people that make up this Leviathan); they define rules plus install all the authoritative and regulated middle man systems which are so much despised by Bitcoin, Blockchain, and friends. So, to quickly summarize, man was thrown into a decentralized world, and later on evolved into one of centralized control (power borrowed from the people). Why should that evolutionary step — will you, nill you — not happen to Blockchain, too? To be fair, the comparison is not fully made on equal grounds: For the early humans, to gain an edge (also over their peers, not just the ferocious animals roaming their prehistoric world), the cute little scattered cavemen were already better off teaming up with a very small number of other people, e.g., 2–10. They were not competing against the entire world (as is the case for the Blockchain system), but only against the small number of peers in their given locality. So, to gain an edge over the rest of the world (aka all the other users) in the Blockchain case, there needs to be a Leviathan of global scale. You need to capture a seizable share of all the participating computing nodes on our planet to make a difference and exert control. Hoewever, there is an incentive to build one such Leviathan: Say you are part of a cluster that encompasses 30% of all nodes in the (Blockchain) system. And say this cluster is by far the biggest, globally speaking, so that it can exert control (although not in 100% of cases, since the cluster share is just 30%), then this presents an edge over scattered and non-organized nodes: Why? Because the cluster’s inside nodes can synchronize and orchestrate their actions. Sure, the gains versus the non-organized nodes won’t be exuberant since a cluster node is just one node amongst thousands or millions of others (30% of the global system still is a lot of nodes), and the enforcement of your interests will need to undergo democracy-style voting schemes, too. But there is an edge and so there will be the emergence of such a cluster. Some day. Of course, it also depends on the crypto asset the Blockchain is loaded with. It must be valuable and desirable, worth the massive effort of cluster building. Money as crypto asset certainly is — enter Bitcoin and Ether. Remarkably, there has been one such case of a dominating cluster exerting power in the still-young history of Bitcoin: In 2013, the BTC Guild, a cluster of orchestrated computing power (encompassing back then approximately 20% of computing power of the entire Bitcoin network) mined six blocks in a row. This event did create ripples in the water of the inaugurated Bitcoin community. It even led to BTC Guild’ self-imposed commitment to limit the number of its nodes. But what if such a cluster does not happen to be so benign? After all, power and money are involved. And man’s history has shown that this is a toxic mélange that will eventually lead to abuse. And so, the only aspect where the Blockchain truly excels over centralized systems — too dearly paid for with an overwhelming number of disadvantages — will eventually go away. And then leave us with just that, the overwhelming number of disadvantages. All of the pain, none of the glory. With Blockchain, centralized power is dead; the Leviathan is dead. Long live the Leviathan. Nodes are not necessarily miners. You need to differentiate here. 30% of nodes manipulating their copy of the bitcoin blockchain just doesn’t work because of the PoW which would need to be repeated. On there other side, if a nodes are operated by mines, not the number of node are important but the hash power. If a group of miners could gain control over a high amount of hash power they would be able to mine several blocks in row and could use that for censorship, transaction manipulation and double spends. But that would only work as long as they can keep up the hash power over a longer time. Long story short: I don’t get your point here. Where exactly is the Leviathan? Hey Daniel, thanks for the comment and yes, you right that it’s not just the number of miners, but the cumulated hash power (which does not make a difference, so I simplified to #miners/nodes). Regarding your question: Well, you just described it yourself in your comment, that forming of a Leviathan.